The barbacoa taco at Tortas Factory del D.F. When I saw Tortas Factory del D.F., I immediately turned into the parking lot even though I had lunch plans at a Korean restaurant just up the road. It was the initials that caught my attention: D.F. stands for Distrito Federal, Mexico City’s former name. 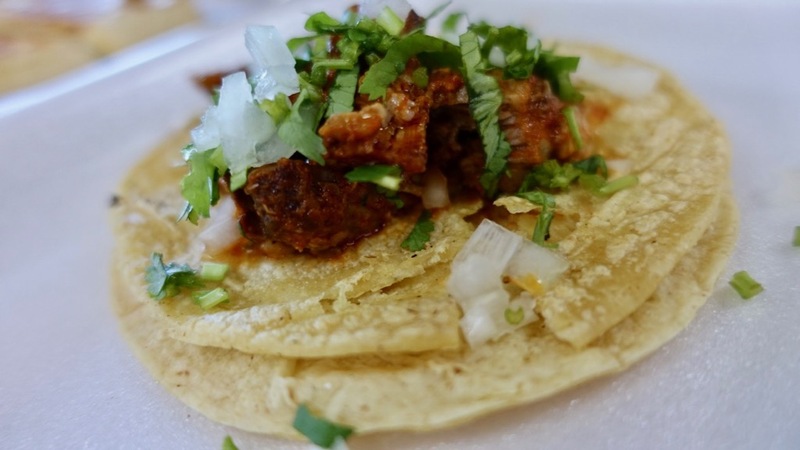 My family is from Mexico City, and memories of al pastor tacos flooded my head. Sure enough, the restaurant is owned by a family from Mexico City, and though the place has “tortas” in its name, it offers everything from sopes (a round disc of masa topped with beans, cheese, shredded lettuce, and crema Mexicana) to enchiladas to enormous meat and cheese filled quesadillas. And just like in D.F., you’ll find al pastor (marinated pork) cooked on a trompo (the revolving spit like you see at shawarma place). Unlike some taquerias that only break out the trompo on the weekends or special occasions, Tortas Factory intends to have it up and running every day. You can eat the shaved, bright red pork in tacos or a sandwich. Tacos are served on doubled-up El Milagro brand tortillas. In one version, tender hunks of slow-cooked lamb barbacoa had the perfect balance of gaminess and pasilla chili heat. The condiment selection is limited: red and green salsas, fresh cut limes, and a colorful mix of shredded jalapeños, red onion, and habaneros doused with lime and salt. But it’s just enough to kick up the heat. The pambazo at Tortas Factory del D.F. As its name would suggest, Tortas Factory serves all sorts of sandwiches. They come on soft, white bolillo rolls baked daily by Panaderia Del Valle, the bakery directly behind the restaurant (it’s conveniently owned by the same family). My Mexico City-born father was most excited to see a pambazo (a colorful variation on the classic torta) on the menu. 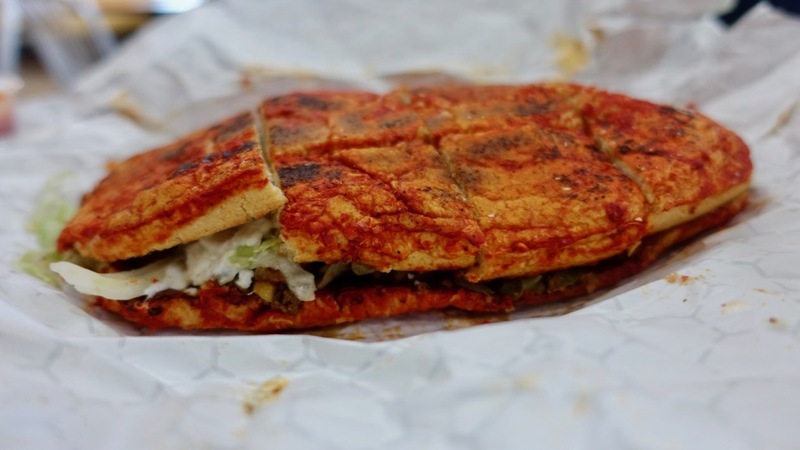 The pambazo’s bread turns red because it’s dipped in a red guajillo pepper sauce; it’s then filled with potatoes, chorizo, shredded lettuce, and crema Mexicana. According to my father, it was an excellent version, although Tortas Factory chooses to cube the potatoes that it mixes with the chorizo rather than puree them, which is customary.